“It’s Girl Scout cookie time!” Those familiar words send people scrambling to get their fix of the popular once-a-year treats. But although many may think of cookies when they think of Girl Scouts, for 100 years the organization has reached far beyond satisfying a sweet tooth. Celebrating its centennial in 2012, Girl Scouts has long been dedicated to helping girls develop the skills they need to become leaders. Founded by Juliette “Daisy” Gordon Low in Georgia in 1912, Girl Scouts of the USA has grown over the last century to become the largest organization for girls in the world, with a membership of 3.2 million—2.3 million girls and 880,000 adults. Its mission: build girls of courage, confidence, and character, who make the world a better place. The first Girl Scout troop in Minnesota began in 1914. Girl Scouting came to Rochester in 1927 when Miss Belva Snodgrass, principal at Rochester High School, organized troops for girls who were high school juniors and seniors. Today in Olmsted County more than 1,300 girls of all ages participate in Girl Scouts through a variety of activities, including troops, camps, events and community partnerships. As part of its centennial celebration, Girl Scouts of Minnesota and Wisconsin River Valleys Council is honoring 100 Girl Scout alumnae. Nominated by friends, family, coworkers and community members, and selected by a volunteer committee, each of the 100 centennial honorees live their lives in accordance with core Girl Scout values. Five local women are among those chosen to receive centennial awards. Marilyn Stewart, past owner and retired manager of Edina Realty in Rochester, and Ancy Morse, retired Olmsted County district judge, are receiving the Trailblazer Award, given to Girl Scout alumnae whose pioneering efforts opened the door for other women to follow. Kathleen Meyerle, legal counsel in Mayo Clinic’s Legal Department, is being given the Community Champion Award for alumnae who have made significant contributions as community volunteers. 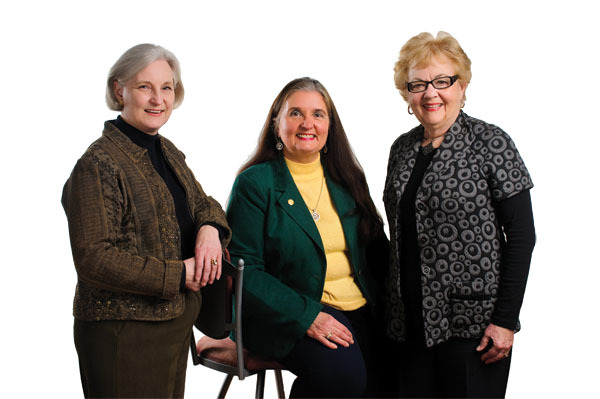 Judith Kinsey, who is now retired from IBM, and Barbara Payne, a senior project manager in Mayo Clinic’s Department of Laboratory Medicine and Pathology, were named Forever Green Award recipients for demonstrating outstanding commitment, exceptional service and extraordinary dedication to the Girl Scouts. For Meyerle, currently a member of the River Valleys Board of Directors, one of the biggest benefits of being a Girl Scout, yesterday, today and tomorrow, is the pathways it can open for girls. Tracy Will, a local freelance writer and mom to a Brownie scout, is grateful to the Girl Scouts for showing her daughter that the future is bright for girls with courage, confidence and character. This entry was posted in Personal & Professional on February 29, 2012 by Tracy Will.